A couple of weeks ago, Ross Fish from Moffenzeef Modular sent us the new Muskrat module, a dirty percussion voice based on his MSG experimental sound box. 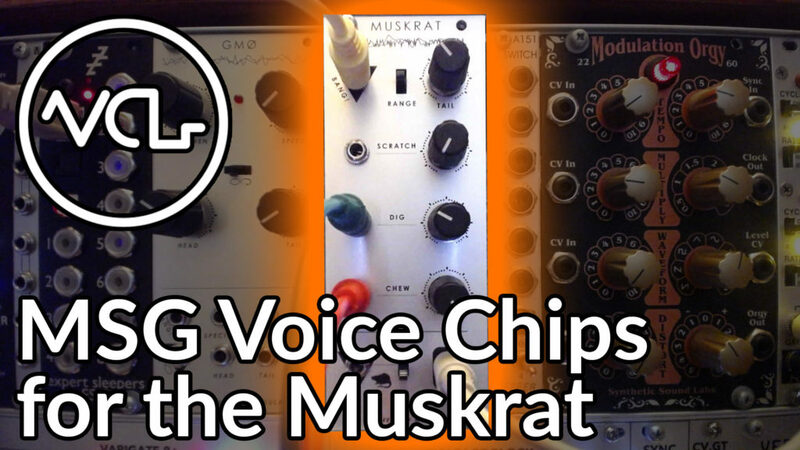 This week, we tested the MSG expansion chips, 5 additional firmware versions that can be swapped out of the Muskrat to dramatically alter it’s functionality. The Muskrat is already an amazing synth, but the MSG expansion chips each provide a new view into the potential of this module. The additional chips contain different firmware code, adding to the existing wavetable and phase distortion techniques on the original chip with frequency modulation, amplitude modulation, phase modulation, wavetable synthesis with amplitude modulation and granular synth. The F chip performs frequency modulation using two internal oscillators, a carrier and a modulator. The scratch control modulates the FM index or the amplitude of the modulator, while dig controls the rate of the modulator with the switch at the bottom toggling between LFO and audio rate modulation. The carrier pitch is controlled by the chew knob, which acts as the main pitch knob for every mode. The bang input envelope follower and the tail and envelope range switch act the same in every mode as well, triggering and attenuating the voice. The A or amplitude modulation chip works in a similar way, with the scratch knob acting as a detune function for the modulator voice. This chips can generate some really nice atonal results. The phase modulation chip, indicated by the P on the chip is a bit different. The Muskrat switch swaps between a grungy triangle wave and a squished sawtooth wave, while the scratch knob acts as a bit shifter generating some gritty high end frequencies. The dig knob controls rough phase shifting which tends to sound like octave transposition, or different intervals when bit shifted. The wavetable with AM mode is very similar to the original firmware, but slightly less aggressive. Instead of wavetable phase distortion and folding, the wavetable is amplitude modulated, with the rate of modulation controllable via the scratch knob. The Muskrat switch toggles between LFO and audio rate modulation. The granular chip, marked with a G, is wild. The module chooses from a collection of short samples selected by the dig knob, looping the sample with control over loop length (aka grain size) via the scratch knob. The bottom switch reverses the grain. This one can create some really glitchy, vocal style tones. Some real magic here. What modules would you like to see us cover in future videos? Tell us in the comments!